Those who are very new to stock markets,Investors,Students who want to have a kick start in Learning Technical analysis, charting and Basic indicators chartnexus, a free EOD charting tool comes to rescue. Chartnexus offers End-of-day data and three years of historical data are available to users free of charge. Currently the charting package supports Linux, Mac OS, Windows XP/Vista/7 operating systems. I had tested personally in my ubuntu machine and it works good as it works smooth in windows machine. Provided the snapshots from my ubuntu machine. Chartnexus bascially provides Indian Exchanges like NSE, BSE , American Exchanges, Hong Kong, Malaysia, Chinese , Singapore, Phillipines and United Kingdom stock exchanges (cash market) EOD data with autodownload functionality. So data manintanence is less effort here. The charting package includes a comprehensive list of stocks and indexes. More impressively, the software is able to offer all these features free of charge. And almost all the basic indicators are supported by this charting software. When comes to drawing tools it supports Drawing Trendlines and Fibonacci retracement tool. 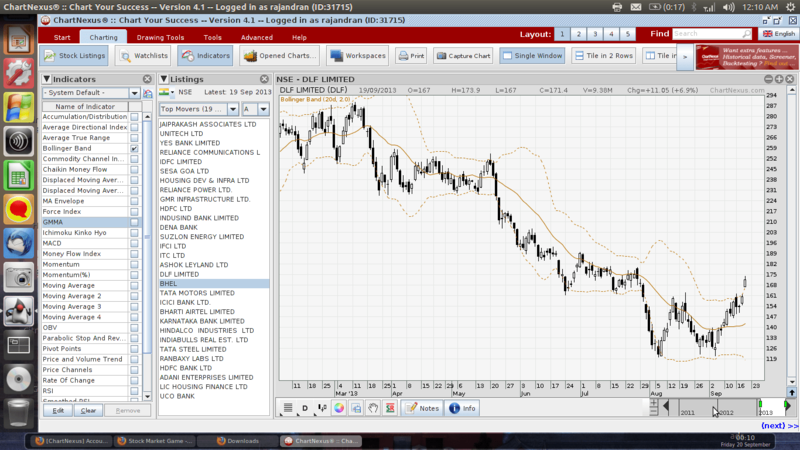 ChartNexus version 4.1 onwards it the charting package supports multi-layout feature in to see more charts and do more. There will be a total of 5 layouts which you can customise to display your frequently used features and charts. With this multi-layout feature, Charting experience is greatly enhanced and is more efficient. Does Chartnexus supports realtime data? 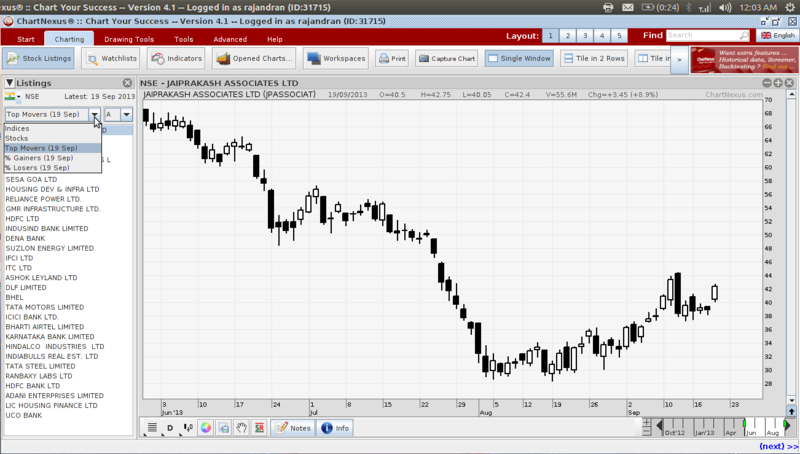 Who can use chartnexus EOD software? Chartnexus is designed for investors,positional traders and students willing to learn technical analysis. However if you are professional trader or intraday trader then its not a right charting package for you. Does Chartnexus support custom indicators? Yes rules based scanning is possible the utility is called Xpert trader, however that functionality is currently not available at free of charge. Does it has inbuilt portfolio tracker? Does it supports Futures, Commodities, Forex Markets? In the next version 4.2 release which is slated to be released in the last quarter of 2013, ChartNexus software will be integrated with social media elements to greatly enhance user experience. You will be able to view charts, read other traders’ comments and participate in conversations instantly in the software. This is a giant step forward for ChartNexus and we will be anticipating this release. Bloomberg UTV : Forex Trading is Illegal in India : Critical Analysis The 20 minutes coverage on Bloomberg UTV study clearly mentions that Indian Individuals trading in Forex Markets are purely illegal. can we download metastock software from any website, just like MT4, if i want metastock where can i find it and sir ji which is the better charting software MT4 OR METASTOCK ? I am not able to download data in Chart nexus. i am getting error messages. I contacted customer support. I have been following up with them for more than a month now. But still the issue is not solved. They asked me to downgrade the java version, install offline java version, change the data downloader- I did everything. Even i reinstalled more than 5 times, but still I am not able to download the data. I feel that customer care agent either doesnt have knowledge on this or they dont know how to solve the issue at all.